Haq's Musings: How Will Obama's TPP and TISA Trade Deals Help Pakistan? How Will Obama's TPP and TISA Trade Deals Help Pakistan? US President Barak Obama is pushing legislation to gain fast track authority to negotiate Trans Pacific Partnership (TPP) and Trade in Services Agreement (TISA) as part of his pivot to Asia. TISA faces stiff opposition from Obama's fellow Democrats and organized labor who fear significant loss of American service sector jobs to other TISA member nations. Pakistan is one of the countries that will likely benefit from these trade deals. President Obama is expected to get the authority he seeks because TPP and TISA are both supported by the pro-business Republicans who now control both houses of the US Congress. Trans Pacific Partnership is crucial for America's Pivot to Asia which is aimed at checking China's rise and maintaining America's continued relevance in Asia. It is part of America's answer to Chinese-led Asian Infrastructure Investment Bank and Silk Road fund to promote Chinese trade with Asia and Europe. China-Pakistan Economic Corridor is the first major piece of this Chinese plan. Pakistan's inclusion in TPP and TISA confirms America's continued interest in maintaining close ties with its old Cold War ally in South Asia. Trade in Services Agreement is being negotiated among United States, European Union, Australia, Canada, Chile, Hong Kong, Iceland, Israel, Japan, South Korea, Liechtenstein, New Zealand, Norway, Switzerland, Taiwan, Uruguay, Colombia, Costa Rica, Mexico, Panama, Peru, Turkey, Pakistan and Paraguay. These countries make up about two-thirds of the global GDP. Trade in service is being more and more important with rapid growth in services sector of the world economy. Services now account for nearly two-thirds (64%) of the world GDP with the rest coming from manufacturing (30%) and agriculture (6%). Services account for even higher percentages of GDP in US (80%) and EU (73%). Service sector is also the largest and fastest growing sector of Pakistan's economy. Services account for nearly 60% of Pakistan's GDP while manufacturing and agriculture each contribute about 20%. It therefore makes sense for Pakistan to join multilateral trade in service deals like TISA. A key TISA provision likely to benefit Pakistanis is ease of visa restrictions for “Movement of Natural Persons” among member nations which include the United States, the European Union, Japan, South Korea, Australia and Canada. This section discusses commitments by the parties not to place undue burdens on visas and singles out face-to-face interviews as an example of “overly burdensome procedures.” Even before this agreement is in place, there has been a growing ravel from Pakistan to US with 78,000 Pakistanis traveling to the United States on various non-immigrant visas in 2013, the most recent year for which data is available. Other provisions of TISA would ease outsourcing of a variety of services from America and Europe to Pakistan. These include information technology services, back office services, medical, engineering, legal and accounting services. These outsourced services will help create job opportunities for hundreds of thousands of college grads pouring into the job market every year. The US-China competition appears to be quite beneficial to Pakistan as both great powers continue to court the country through trade and investment deals. I hope Pakistani leaders will play their cards well to get the maximum help they can to build the country's human resources, infrastructure and economy. How Will Robots Impact Late Industrializers? There is GATS, general Agreement on trade in services, of WTO. What is extra benefit of TISA? Akber: "There is GATS, general Agreement on trade in services, of WTO. What is extra benefit of TISA?" TISA deals with services, not material goods, and its benefits are more like NAFTA free trade zone in that sense. Farooq: " America has been trying to help us for more than 50 years and see where we are today"
The biggest responsibility for Pakistan's problems lies with Pakistanis themselves. No one, not even God, can help a people who don't help themselves. Akber: "GATS also deals with service, not goods. U.S. , through TISA, may be negotiating a preferential agreement with Pacific rim countries but not including Pakistan"
GATT was replaced by WTO many years ago. It was signed long before service sectors contribution to GDP became dominant, and well before technology-enabled outsourcing started. Business Process Outsourcing (BPO), for example, is a relatively recent phenomenon. TISA is a much more modern version and, as you can see on the map in my post, it definitely includes Pakistan. Akber S: "GATS. Not GATT. Also, GATT was not replaced by WTO. GATT is part of WTO agreement. So is GATS." 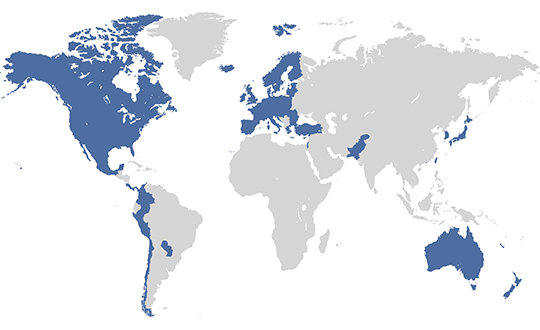 TISA is a US-led effort being pursued with a subset of WTO membership under GATS Article V.
The substantive merits of a proposed TiSA would be easy to applaud if the negotiations were being presented for what they are: potentially the largest preferential trade agreement pursued under GATS Article V to date. Based on the limited information that has filtered out of the nascent talks, a number of genuine reservations may be advanced, both procedural and substantive, that the agreement being devised could easily or anytime soon be incorporated into the World Trade Organization (WTO) architecture, let alone replace it. This is merchandise exports only India's CAD has also fallen in the past six month.Why? India's main merchandise exports are petroleum products,gems and jewelry,engineering goods,pharma,textiles and autos. The fall is almost entirely due to decline in value of crude oil(which means lower prices for petroleum products) and gold(which means lower prices for gold jewelry) which is more than compensated by a much reduced gold and crude oil import bill hence the declining CAD. Btw S Korean exports are also down by 15% this month as are those of most other countries. Anon: "The fall is almost entirely due to decline in value of crude oil(which means lower prices for petroleum products) "
Petroleum products make up about 20% of India's merchandise exports. If you are correct that the entire 20.2% decline is due to petroleum prices, does that mean India's petroleum exports are near zero? Petroleum products value is down by 50%,Gems and Jewelry value is down by around 30-40%.These two account for around 80% of the drop in exports.Excluding these two the decline is about 4% which is more than compensated by decline in crude oil prices. Indian Crude imports > Indian petroleum exports. The key thing to look at is the CAD.That has dramatically improved and is now around 1% of GDP well below the safe threshold of 2%.The latest PMI numbers from India are pointing to a manufacturing revival. Still no room for complacency. Riaz, does Pakistan like India violate the Hague Convention ( on the legalization of documents ) by insisting that all documents originating abroad should be further attested/legalized by Indian Missions abroad and slyly getting the applicants to sign an undertaking that no legal action will be taken against the Indian Mission, concerning the matter, no refund of attestation/legalization charges will be made,and responsibility will fall on the applicant. This violation of the Hague Convention results in massive headaches seeking to present documentation in India. As you may be aware photocopying is a major industry in India. Financial services company India Nivesh has warned that when the Trans Pacific Partnership (TPP) comes into effect, India would be negatively impacted to a major extent; though India would not be the only country at disadvantage. China, Pakistan, Bangladesh, Sri Lanka and other non-members of TPP would also be adversely affected. The US is in advanced stages of closing the Trans Pacific Partnership (TPP) agreement – one of the largest free trade agreements signed involving 12 countries. In a report,India Nivesh said the entire supply chain would undergo a major change as Vietnam would enjoy duty free access to one of the largest textile and apparel market i.e. the US. This would render other non-member countries at disadvantage reducing their competitiveness in the global market. The report said Indian companies can try to work around the TPP by establishing capacities in Vietnam and take benefit from TPP instead. China has already begun investing in Vietnam to benefit from TPP. This is a huge opportunity for Indian companies as they have various incentives from Indian and Vietnamese governments. To take advantage of yarn forward rule, spinning and weaving capacity would be more beneficial, as garment capacities are in abundance in Vietnam. With the nearing expiry of Technological Fund Scheme by March 2017, setting up capacities in Vietnam offers an alternative for cost effective expansion. India would be positive on companies establishing their manufacturing capacities in Vietnam especially in spinning and weaving, as they exhibit their foresightedness to take advantage of benefits of TPP. Pakistan’s merchandise trade deficit surged by 10.68 per cent to $22.095 billion in 2014-15 from $19.963 billion in the preceding fiscal year, according to the data of Pakistan Bureau of Statistics. Exports have been witnessing a falling trend since July 2014. However, imports rebounded which was reflected in higher volumes of machinery, food products, transport, agriculture, chemicals and textile groups. The government has projected a trade deficit target of $17.2 billion for the fiscal year. An official report reveals that the trade deficit witnessed in 2014-15 was the highest since 1980-81. The second highest trade deficit was recorded at $21.271 billion in 2011-12, mainly driven by imports of consumer goods and higher international crude prices. The import bill reached $45.98 billion in 2014-15 as compared to $45.073 billion in the previous year, an increase of 2.01pc. Its target for the year was projected at $44.2 billion. In June 2015, the imports volume reached $4.394 billion as compared to $4.318 billion in the same month last year, an increase of 1.76pc. Monthly imports, during the year, averaged at $3.8 billion as compared to $3.758 billion in 2013-14. Around 50pc of Pakistan imports were originated from just a few countries like China, Kuwait, Saudi Arabia, UAE, India, Indonesia, etc. During the fiscal year, imports from China increased sharply to 23pc from 17pc a year ago. The trade imbalance in favour of China is highly alarming. Free Trade Agreements signed with some of the countries appear to have been playing a major role for this imbalance. By and large, the relative shares of imports from other countries have remained almost the same. On the other hand, exports fell by 4.88pc to $23.885 billion during the period under review as compared to $25.11 billion a year ago, the highest ever export figure recorded as of yet. In June 2015, the export proceeds fell to $2.016 billion as against $2.018 billion in the same month last year. Monthly exports averaged at $1.997 billion as against $2.098 billion during 2013-14. The country’s exports have been stagnant at $24-25 billion for the last few years. According to a UN study, covering a 30-year period (1980-2011), India’s share of world exports improved from 0.43pc to 1.7pc; Bangladesh’s from 0.04pc to 0.14pc; Malaysia’s from 0.74pc to 1.34pc and Thailand’s from 0.37pc to 1.35pc. Pakistan’s share, however, remained stagnant at 0.15pc. Since January 2014, when duty-free access to the European Union under the GSP+ scheme was granted, Pakistan’s exports to Europe spiked by 21pc, but this was at the cost of other markets. Pakistan’s exports base and markets are extremely narrow. Over 55pc of its exports earnings are contributed by the cotton group alone. Leather, synthetic made-ups and rice contribute about 14pc of total exports. Unfortunately, these items are relatively low value-added products. The lawsuit revealed that ClearCorrect was sending scans of its customers' teeth to an affiliate in Pakistan, which created digital models on computers before sending the data back to 3D printers in Texas to be transformed into molds for braces. Align then went to the ITC, which ordered ClearCorrect to stop importing the tooth-model data from Pakistan. A fight over a patented way to straighten teeth may wind up giving Hollywood studios, book publishers, software developers and other copyright holders a new ally in their fight against piracy. At issue is whether the U.S. International Trade Commission — a federal agency that resolves complaints about imports that violate U.S. copyrights, patents and trademarks — has jurisdiction over data that comes into the country through the Internet. The dispute pits Align Technology of San Jose, which makes Invisalign braces, against ClearCorrect of Round Rock, Texas, which makes a competing brand of transparent teeth-straighteners. Align initially sued ClearCorrect in federal court for allegedly violating its patented method, which involves creating multiple digital models of a patient's teeth to produce the succession of plastic braces. The lawsuit revealed that ClearCorrect was sending scans of its customers' teeth to an affiliate in Pakistan, which created digital models on computers before sending the data back to 3D printers in Texas to be transformed into molds for braces. Align then went to the ITC, which ordered ClearCorrect to stop importing the tooth-model data from Pakistan. The decision, if it stands, would be a watershed — the first time the ITC stopped imports that arrived electronically. And the major studios and record labels are eager to explore how the agency might help stop foreign websites from delivering bootlegged movies and songs to U.S. Internet users. But a number of technology industry companies have joined ClearCorrect in challenging the decision, arguing that the law gives the ITC purview only over tangible goods. Besides, they say, the ITC can't exactly order U.S. customs agents to open every digital packet entering the country and inspect it for infringing items. Stopping information from flowing through the Internet isn't as simple as turning away a truckload of infringing orthodontics at the border. Still, entire industries are replacing their physical products with digital ones. Confining the ITC to tangible goods would leave it unable to do the job Congress created it to do, which is to protect U.S. companies from unfair competition by foreign rivals. Granting the ITC jurisdiction over data imports should not, however, lead to the agency imposing broad restraints on Internet service providers in the hope of shutting down foreign piracy hotbeds. The agency's reach shouldn't extend beyond those directly involved in or profiting from the infringements, whether it be digital or physical. And to make sure the ITC stays within that boundary, Congress should specify just how far the agency can go to remedy infringements online. The services sector contributing by 59.2% to Pakistan's gross domestic product (GDP) exported services worth $5.4 billion in fiscal year 2015-16 (FY16), with a deficit of $ 2.9 billion as compared to last fiscal. The deficit of $ 2.9 billion was 3.8 percent lower than the deficit recorded last year and the State Bank of Pakistan (SBP) attributed this small improvement mainly to a reduction in the freight deficit, which is the largest component in the country's services trade profile, as a result of the big decline in oil prices. Services exports' share in the economy has gradually increased from 50 percent in FY00 to 59 percent in FY16 .However, past data suggests that services exports have stagnated around this level since FY10. 'The commodity producing sector, which has been growing at a slower pace as compared to services, may not be able to generate sufficient exportable surpluses to meet the country's growing foreign reserves needs', SBP added. Inflows under government services - primarily Coalition Support Fund (CSF) and other military services - account for more than one-third of the country's total services exports. This is substantially higher than the share of government services of only 2 to 3 percent in the world trade in services. Given the non-economic and one off nature of government services, the high share does not bode well for long-term stability of export receipts. Incidentally, flows under CSF dropped drastically in FY16, the central Bank elaborated. 'The current level of Pakistan's services exports does not reflect the country's true potential. Concerted efforts are needed to facilitate services exports by strengthening the regulatory framework; well-thought liberalisation of trade in services; investment in human resource development (especially in education and training for select services); improving access to finance for service-oriented industries; encouraging the private sector to form services coalitions and enterprise networks; promoting specialization in financial services; and improving data availability', SBP suggested. Non-CSF government services exports have recorded a sizable growth over the last two years; if this trend continues, it may cushion any further fall in FX receipts under CSF. The export of commercial services, which is obtained by adjusting overall export of services for government services, has remained almost flat at $ 3.4 billion since FY11. These were only 1.2 percent of GDP in FY16, which is far below the global average level of 6.0 percent of world GDP. These exports are concentrated in transport, Information Communication Technology (ICT), travel, and business segments. These four (out of 11 major categories) have a combined share of more than 90 percent in overall export of commercial services. ICT services exports, which continued to increase up to FY13, have stagnated since then. This stagnation is largely stemming from telecommunication services, as revenues from foreign network operators (for calls that originate from outside Pakistan) are declining. This drop has come about as internet-based messaging and voice services, like Skype, Viber and Whatsapp, have gained tremendous traction locally. However, the negative impact was largely offset by the growing export of computer services. Exports of both software consultation services and of computer software, have maintained an upward trajectory since FY06.